Prayers for Priests - My Catholic Life! and the strength of Your Spirit. and to the power of the ministry which I have received. for love, only for love, and for a higher love. in the service of Your Church. and gratitude for my steadfastness. grant that I may entrust my life to you each day. Almighty God, we pray that your grace may assist us in the ministerial priesthood to serve you worthily and devoutly, in complete purity, and in good conscience. And if we are unable to live our lives with such innocence, grant that we weep bitterly over the evil we have done. Grant that we may serve you ever fervently with a spirit of humility, with right intention of good will. We ask this through Christ our Lord. Amen. 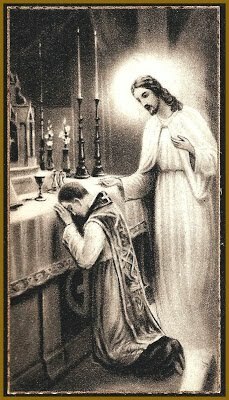 O good Jesus, make me a priest after your own Heart. Most beloved Jesus, with a singular benevolence you have called me from among thousands of men to follow you in the excellence of priestly dignity. I beg you for the divine strength to rightly fulfil my ministry. I implore you, Lord Jesus, to daily renew the grace given to me through the imposition of the hands of the Bishop. O most powerful doctor of souls, heal me so that I may not fall back into evil, that I may flee from every sin, and that I may do what is pleasing in your eyes until the hour of my death. Amen. Lord Jesus Christ, spouse of my soul, delight of my heart and my soul, I fall on my knees before you, praying and fervently beseeching you to allow me to persevere and grow in the true faith each day. O sweet Jesus, grant that I may reject all impiety and that I may be a stranger to the carnal desires and earthly concupiscence which fight against my soul. Through your help, may I preserve my chastity unstained. O most holy and immaculate Virgin Mary, Virgin of virgins and most beloved Mother, purify my heart and soul each day, and obtain for me a holy fear of the Lord and a particular distrust of my own strength. St. Joseph, guardian of the virginity of Mary, keep my soul from all sin. All of you holy Virgins who unceasingly follow the divine Lamb, be solicitous to me a sinner, that I may avoid sin in thoughts, words, actions or omissions, and that I may never be far from the most chaste heart of Jesus. Amen. and that their lives be a true reflection of Your life. and speak to His people of God. serving the Church as she asks to be served. and doing good for all. and living the joy of the gift they have received. Three prayers published by the Congregation for Clergy along with its message for the World Day of Prayer for the Sanctification of Priests. The day will be celebrated June 11, the feast of the Sacred Heart of Jesus. See Message published by the Congregation for Clergy for the World Day of Prayer for the Sanctification of Priests.